Swaddling – babies in a tight bind! 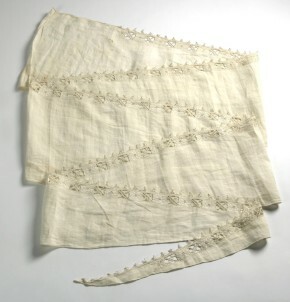 I thought the task of changing a baby’s nappy was pretty arduous, but recently I have been looking at the babies clothes from 300 years ago and I can only conclude that children and their carers nowadays have never had it so easy! Our stoic forebears didn’t have babygros with quick release snappers or disposable nappies instead they would wrap/swaddle their charge in up to 12 different layers of clothing. A task made even more impressive when you consider that it was all held in place with pins, there were no washing machines and soap was taxed as a luxury! ‘The firſt great Miſtake is, that they think a new-born Infant cannot be kept too warm; from this Prejudice they load and bind it with Flannels, Wrappers, Swaths, Stays, &c. commonly called Cloaths; which all together are almoſt equal to its own Weight.’ William Cadogan. A swaddled child was rendered immobile, preventing it from roaming and possibly injuring itself. At this time, carers concern over children’s health was substantiated with death lists recording half of those that died were children under 5 years old. However Cadogan identified that carers were actually contributing to the high infant mortality rate through swaddling. There were many advocates against swaddling including John Locke who wrote in 1693 in ‘Some Thoughts Concerning Education’ that children’s clothes should not be too heavy, tight or warm. But it was the London-based physician William Cadogan who provided evidence through his research with orphans at the London Foundling Hospital that children who were tightly swaddled were much weaker than those that weren’t. ‘The Mother who has only a few Rags to cover her Child looſely, and little more than her own Breaſt to feed it, ſees it healthy and ſtrong, and very ſoon able to ſhift for itſelf; while the puny Infect, the Heir and Hope of a rich Family lies languſhing under a Load of Finery, that overpowers his Limbs, abhorring and rejecting the Dainties he is crammed with, till he dies a Victim to the miſtaken Care and Tenderneſs of his fond Mother.’ William Cadogan. ‘It wants leſs Cloathing than a grown Perſon, in proportion; becauſe it is naturally warmer, as appears by the Thermometer.’ William Cadogan. ‘Weight and Heat of theſe Swaddling-cloaths, they are put on ſo tight, and the Child is ſo cramp’d by them, that its Bowels have not Room, nor the Limbs any Liberty, to act and exert themſelves in the free eaſy manner they ought.’ William Cadogan. Under the influence of Locke, Cadogan and later Jean-Jacque Rousseau the attitudes and practices of children’s clothing and care changed immeasurably. And by the end of 18th century in Britain the practice of swaddling had been abandoned for loose-fitting, lighter, wrapping gowns and frocks for all infants. An essay upon nursing: and the management of children, from their birth to three years of age. By a physician. In a letter to one of the governors of the Foundling Hospital. Published by order of the General Committee … by Cadogan, William, 1711-1797. at http://ota.ox.ac.uk/id/5515 via http://writersinspire.org/content/essay-upon-nursing-management-children-their-birth-three-years-age-physician-letter-one. Accessed on Saturday, March 12, 2016. Being born in the early hours of New Year's Day can make you something of a celebrity, as fodder for your local media outlet. It can make you an ad star, too. Fisher-Price found a bunch of New Year's newborns for its "Wishes for Baby" spot, filmed in the waning hours of 2014 and the early ones of 2015—in 10 hospitals in seven counties (the U.S., Japan, Mexico, Brazil, Kenya, Bangladesh and Poland). Local film crews captured footage of new moms talking about their wishes for the babies. The footage was then turned around in less than 24 hours by Weber Shandwick and documentarian Patrick Creadon (Wordplay, I.O.U.S.A., If You Build It) and crafted into a 90-second spot. "The first time you hold your baby, you wish so many things for them," said Creadon, himself the father of three young children. "You're filled with an incredible desire that they have every opportunity in life. I was drawn to this project having filmed the births of my own children and knowing that new life, combined with self-reflection brought on by a new year, would be a powerful thing to portray." The spot launched a new campaign for Fisher-Price called "Best Possible Start." "The best possible start begins with love," says on-screen text at the end of "Wishes for Baby." Soon enough, presumably, it will include Fisher-Price toys as well. The brand wants consumers to engage with the campaign through the #WishesForBaby hashtag. Author, illustrator and mother of two Adele Enersen will depict the most popular wish themes from around the world in "charming, artful responses," Fisher-Price says.